It would be fair to say that my interest in Georgian Food and Wine was negligible. I didn’t hold out much hope that the modestly subtitled ‘A food and wine journey in the Caucasus’ would alter an unassailable opinion that nothing much matters on subjects about which I am completely ignorant. What language do they speak in Georgia? What alphabet do they use? Why would I have any reason to discover anything about it? Carla Capalbo’s encyclopedic volume changed all of that. It is a book to be read attentively. It is so densely packed with information that a momentary lapse in concentration and one might skip through the delightful ‘Toast master’s tale’ or why vine stocks were carried into battle under soldiers’ tunics. Sometimes, the sheer depth of information interrupts the flow of text with their addition in brackets, and page references. I was delighted to find another culture which appears to endorse the relationship between food and wine, social interaction and art and where the quality of life is inseparable from these basic ingredients. Unlike so many cookery books which use images as chapter fillers and to persuade book buyers that their cost is justified, the author’s photographs are not just informative and perfectly complement the text, they are often moving and inspiring: The extraordinary Khertvisi fortress, the home interiors, cellars (such as Archil Guniva’s which contains buried qvevri of many sizes), the stunning double page spreads which introduce each region, the moving portraits of winemakers and chefs and the wonderfully colourful Supra tables (the Georgian equivalent of a banquet) with a large array of different platters, . The recipes are clearly written and are accompanied by beautiful images. The myriad herbs which were used even in the most simple of dishes adding a layer of complexity to their preparation but also, let’s face it, to their cost where herbs (unless you grow them yourself - as they do) are an expensive addition. I am keen to try: stuffed tomatoes, beef and tomato stew, duck with blackberry sauce, vegetables with walnut paste, ‘backcombed’ aubergines, eggs with onions and tomatoes, chicken and walnut stew, spiced meat bread, braised meatballs. I love walnuts and hazelnuts and Georgian cuisine is about making use of their abundant crop. 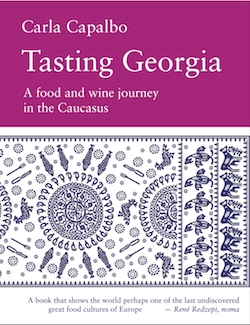 Tasting Georgia is so much more than a book about its food and wines. Its encyclopedic concept is replete with travel ideas and suggestions all brought alive by Carla Capalbo’s photography which only an author gifted with those skills can pull together and match to the accompanying text. Georgia’s natural beauty and historic architecture is captured for the inquisitive reader opening up a whole new world. 'Tasting Georgia' sums up the whole project admirably but only once you've read the book will you begin to understand the diversity inherent in the title.